Davidson's Commissioner Chat Tuesday evening started off with a request for an update on the Red Line, but quickly turned a bit tense when comparisons were brought up to the decision to join Mi-Connection. This snowballed into more discussion on the proposed CHS Mental Health facility at the failed Davidson East site, and after two solid hours of discussion it's safe to say none of these major issues are anywhere near gaining a broad level of community concensus. Tuesday night promises to be an interesting Commissioner Chat at Hopewell Baptist Church on Davidson Concord Rd. The event starts at 6pm. See notice at DavidsonNews.net. This will be the public's first opportunity to ask questions since last week's budget impacting Mi-Connection decision that re-writes the interlocal agreement and gives Davidson some breathing room on its financial stability. One thing that has not been fully discussed is the interest rate (if any) paid by Davidson on the funds loaned to the town over and above the $1 million annual cap the town will pay to cover the subsidy on our 30% ownership. Notable in its absence was any prediction of when annual Mi-Connection subsidies for Davidson might be reduced below that $1 million cap - allowing the Town to begin paying off these accumulating loans from Mooresville. Until that point, the town may be colleralizing any interest payments not made until the loans begin to be paid off. Depending on the terms, that could extend the timeline before Davidson is truly out from under the Mi-Connection issue. There will also likely be some interesting discussion around the proposed CHS mental health facility just down the road from Hopewell Baptist. While many in Davidson may see this facility as a good thing for the community, those most directly impacted by its location have been raising some questions. Some of those questions are fundamental - such as does the current zoning actually even allow this to go forward as a "by right" development. These type of chats are one of the unique opportunities afforded citizens in small town politics. Hopefully, it will be a packed house. UPDATE: Commissioner Venzon was able to confirm at the Chat that no intereste will be charged on the funds loaned to Davidson from Mooresville to fully cover our debt. Good news for Davidson, but it begs the question how long can this go on? If the company does not become self-sustaining, it's hard to see Mooresville being satisfied with this agreement forever. New Mi-Connection Agreement - What does this really mean? Let me say right up front, the decision made by Davidson and Mooresville to revise the interlocal agreement on Mi-Connection is a good thing. Davidson's finances were nearing the tipping point where real negative impacts would be seen. If the proposed budget had gone through without this change. The Town fund balance would have been near a low of 30% after this budget year. If next year had taken the town into the 20s that would have put Davidson into a group of towns in the State nobody wants to be in financially. The Local Government Commission would likely have begun taking a much harder line with the Town - tying its hands. I commend all the work that went into getting this decision over the finish line. However, this doesn't mean the system is out of the woods yet - not by a long shot. Tonight is set to be a good evening for Davidson financially with Mooresville voting 4-2 to give relief to the Town on the Mi-Connection front. The only real question left is what will the Board do with the money. My hope is that this initial $1 million windfall is used to to replenish the money used from Fund Balance over the past couple of years. Using roughly $900,000 of the $1,087,000 that this new agreement will free up in the current budget, the Town can replenish the fund balance to the historical 40% target by the end of the upcoming fiscal year. The remainder should be used to ensure our public safety officers have what they need including appropriate cost of living adjustments. Anything left after that should go to outstanding equipment needs for public safety as well. Next budget year should begin to use this revenue to lower tax rates to more comparable levels to our neighbors. This approach does two things. First, it shows the LGC that Davidson is serious about getting its financial house in order. 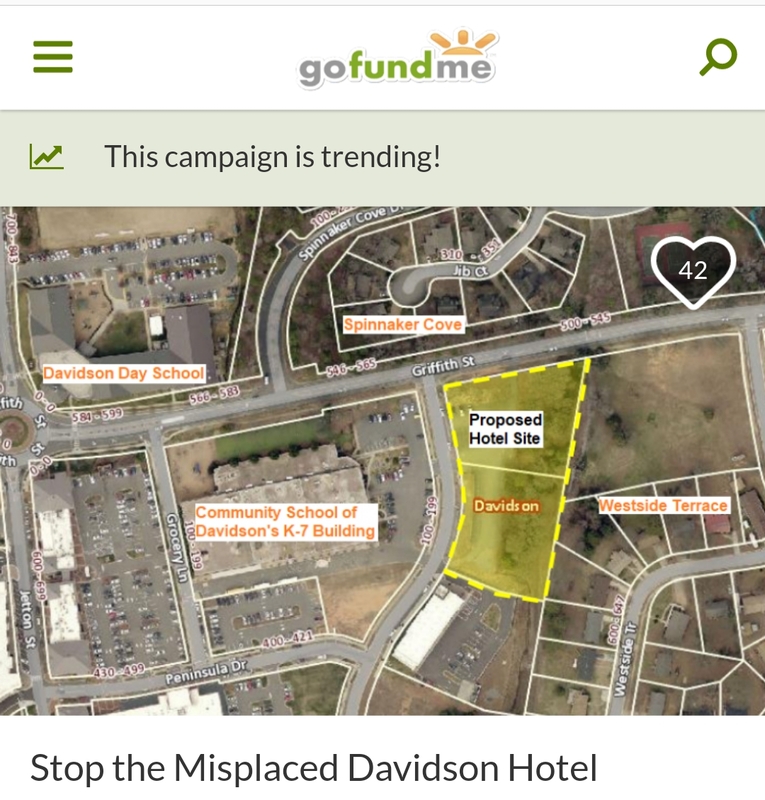 Second, it shows Davidson citizens that the Board is willing to make a hard decision in the Town's financial best interest rather than figuring out how to spend more money. Finally, whatever the decisions made on how this money will be spent, I hope there will be more questions asked in public than what Mooresville's Board did last night. Don't get me wrong, I'm glad they have thrown Davidson this lifeline. However, I'm sure their decision to do so without public discussion raised some eyebrows. That hopefully will not be the case here. Update: Town decides to put entire amount into fund balance initially and raise fund balance percentage of budget to 45%. Story at DavidsonNews.net. Excellent news for taxpayers. Here is some quick and dirty analysis on what the proposed new inter local agreement could mean for Davidson's budget. 1. New ownership percentage goes into place this year. Davidson has 30% responsibility rather than 35%. This means Davidson's budgeted subsidy could drop from $2.087M this year to $1.79M. The town would still only pay $1M this year under the new agreement. 3. No interest on money owed to Mooresville. This is likely not going to be the case, but since interest rates are so low now this probably won't materially change the numbers. The biggest story to hit Davidson in years will actually happen in Mooresville on Monday. "New MI-C agreement would alter towns' formula of risks, rewards"
In a story that was at least partially broken by Vince Winegardner in an email circulated around Davidson on May 12th and posted at DavidsonWatchdogs.org, it appears that Davidson may finally be getting some relief from the ill-conceived financial arrangement on Mi-Connection that puts Davidson deeper in the hole for every customer signed up. If this goes through, Davidson will be freed from at least a portion of the annual subsidy from the Town in the short-term while in effect adding more long-term obligation directly to Mooresville. Per the Mooresville Tribune article this will be taken up on Monday with discussion Tuesday at the Davidson work session meeting. This year's budget discussions have been extremely quiet so far, and the budget needs to be finalized by the end of June. I would strongly encourage people to attend Tuesday's meeting as this decision on Mi-Connection will have the most profound impact on Davidson's budget of any decision in years. If this goes through, any Davidson resident who does not currently subscribe to Mi-Connection could consider doing so while knowing they won't actually be making the situation worse for the Town. That's a very good thing. Tuesday night witnessed one of those rare occasions in Davidson - a split vote on something important. One of the last items on the night's marathon agenda was a change to the Town's planning ordinance changing exactly when and how much community involvement was needed for new proposed development. The vote ended 4-1 with Commissioner Graham casting the lone decenting vote. The change itself involved a streamlining of the review process for certain types of projects in town. Ironically, being a developer Commissioner Graham had actually been through this rather involved process from the developer's side of the table. His disenting vote would have kept the process as-is. That may seem odd in itself, but the truly odd thing was the reaction his differing opinion engendered. Every decision government makes has a cost component. As Davidson struggles through another budget season, a look at a few select decisions over the past year, two occurring in the past two weeks, shows how easily snap decisions add up to ongoing costs that add pennies to our highest-in-the-area tax rate. "But Davidson is special, and we should be willing to pay more." In my opinion, that completely misses the point. There's a huge difference in being "willing" to pay more because you love living in a place and "having" to pay more because of decisions that provide little value to the average citizen. "Growth in revenues is helping the Town move towards it's goal of financial stability and responsible stewardship. Until our committment to MI Connection is reduced we will not be able to achieve this goal. Until we see significant new revenue generation or a reduction in MI Connection requests, we will be unable to fund these items or achieve your financial stability and responsible stewardship goal." I would beg to differ with that statement - especially when it comes to "responsible stewardship". That is always an achievable goal. Before anything like additional tax or fee increases is considdered to provide new revenue, hard choices need to be made. Yesterday and today the blizzard of negative paper for NC-09 continued. I guess the polls must have made it clear a run-off was inevitable. 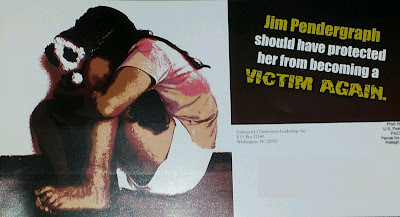 This time the attacks on Jim Pendergraph come from a group called "Citizens for Conservative Leadership, Inc" which sent out similar attacks earlier in the campaign. The PAC was formed just this past March and all of its expenditures have been in the NC-09 race. This one completely crosses any lines of common decency - using an image of a cowering child to hammer home it's message. Now that there are only two candidates in this race, Robert Pittenger should renounce these adds and this support since there's no mistaking that these benefit only him. We "should" hear a denunciation of these by Pittenger. What we will hear instead is crickets. Robert Pittenger spent more personal money on his primary campaign than just about anyone in the country, and it appears to have paid off for him. Civitas has put up a great resource to analyze vote totals across all sorts of demographics, districts, and vote types. Heading into election day, here are links to the early voting stats for a few of the local races that may be of interest in the North Meck area. The last post outlining some possible electability issues went out yesterday at 2pm and by 630pm the Observer had yanked Jim Pendergraph's endorsement, throwing his electability in November into question. See "2 better choices in 9th Congressional District"
Again, I know most people will be incredulous at that suggestion, but here's how this will play out. Do Candidates Matter Or Just Money? Last Friday's post generated some interesting discussion. Since this is a Federal election, "establishment" candidates here simply means those candidates on the RNC's Young Guns list - Pittenger, Pendergraph, and Barry. In my opinion these "establishment" candidates could just as easily cause this situation to occur. However, since they bring the most money to the table, this possibility is being overlooked. The race for the new NC Senate 41 district took center stage at Cornelius Town Hall Tuesday evening. There were 50-75 people in attendance for what was one of the more informative debates I've seen this season. If you missed it, it will be broadcast on Mi-Connection Channel 4 by the end of Thursday - an exact time is still TBD. Maybe the most important thing to say was this district is fortunate to have such a slate of high quality people running. I was particularly impressed with political newcomer Troy Stafford of Cornelius. While he may not have the necessary name recognition this time around, Mr Stafford certainly held his own against some experienced debaters. Robby Benton pointed out that this race has been much cleaner than some in the area, and compared to the sometimes bitter race for NC-9 that's certainly correct. Dr Copeland tried to steel the show with some good one liners. If the number of laughs was the criteria for winning the debate, he was certainly in the running. Stumbled across this analysis a while back and thought it was interesting considering the upcoming election. Early voting starts this Thursday!!! Tuesday 5/1 NC Senate 41 Debate - Cornelius Town Hall 7pm. This is the only debate for what is effectively the general election since no Democrat filed to challenge for this seat. See candidate profiles at DavidsonNews.net. SUNC will be hosting a forum on state wide educational issues. Since education spending is one of the most important and largest expenses for State and Local funding, this important topic is timely with elections coming up next week. Learn about the issues then find out where your candidates stand before next Tuesday's primary. Other invited guests in the audience will include additional public, private and home school officials as well as other elected officials. Come on out for a one of a kind local forum presenting all perspectives on this critical issue.